Because this section will deal with readings for both the fourth Sunday of Advent AND Christmas day, the introductions will be somewhat abbreviated. Please see the links at the bottom of this section to read the full readings for both Masses. 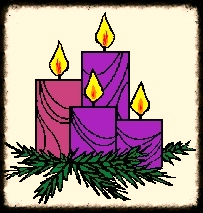 This is our last Sunday of Advent. As we get close to Christmas and the birth our Lord Jesus, the Church seeks to remind us that these events were part of God's saving plan from the beginning of time and foretold centuries before. With great expectation and hope, the people of Judah awaited their savior. Now, that hope is about to be fulfilled. In our first reading (2 Samuel 7:1-5, 8-12, 14-15), the prophet Nathan relates to King David what God had promised - that his heir would spring up from his loins and would inherit his kingdom, which will last forever. Thus, all would know that the promised Messiah would come from the house of David. "It was I who took you from the pasture and from the care of the flock to be commander of my people Israel. I have been with you wherever you went, and I have destroyed all your enemies before you. And I will make you famous like the great ones of the earth. I will fix a place for my people Israel; I will plant them so that they may dwell in their place without further disturbance. . . . The LORD also reveals to you that he will establish a house for you. And when your time comes and you rest with your ancestors, I will raise up your heir after you, sprung from your loins, and I will make his kingdom firm. I will be a father to him, and he shall be a son to me. Your house and your kingdom shall endure forever before me; your throne shall stand firm forever." In our Epistle reading (Romans 16:25-27), we hear a short hymn of glory (doxology) at the conclusion of St. Paul's letter to the Romans. Brothers and sisters: To him who can strengthen you, according to my gospel and the proclamation of Jesus Christ, according to the revelation of the mystery kept secret for long ages but now manifested through the prophetic writings and, according to the command of the eternal God, made known to all nations to bring about the obedience of faith, to the only wise God, through Jesus Christ be glory forever and ever. Amen. Our Gospel reading (Luke 1:26-38) is an account of the angel Gabriel's annunciation to Mary that she was to be the mother of the Son of God. The angel Gabriel was sent from God to a town of Galilee called Nazareth, to a virgin betrothed to a man named Joseph, of the house of David, and the virgin's name was Mary. And coming to her, he said, "Hail, full of grace! The Lord is with you." But she was greatly troubled at what was said and pondered what sort of greeting this might be. Then the angel said to her, "Do not be afraid, Mary, for you have found favor with God. "Behold, you will conceive in your womb and bear a son, and you shall name him Jesus. He will be great and will be called Son of the Most High, and the Lord God will give him the throne of David his father, and he will rule over the house of Jacob forever, and of his kingdom there will be no end." But Mary said to the angel, "How can this be, since I have no relations with a man?" And the angel said to her in reply, "The Holy Spirit will come upon you, and the power of the Most High will overshadow you. Therefore the child to be born will be called holy, the Son of God. And behold, Elizabeth, your relative, has also conceived a son in her old age, and this is the sixth month for her who was called barren; for nothing will be impossible for God." Mary said, "Behold, I am the handmaid of the Lord. May it be done to me according to your word." Then the angel departed from her. Our readings for Christmas draw a direct connection between what Isaiah prophesied more than 700 years before Christ was born ("For a child is born to us . . .") and what took place that Christmas night when the prophesy was fulfilled in all its humble glory. In our first reading (Isaiah 9:1-6), we hear the prophesy of Isaiah that is proclaimed every Christmas eve night - God's own Son will come to deliver us - as Prince of Peace. The people who walked in darkness have seen a great light; upon those who dwelt in the land of gloom a light has shone. You have brought them abundant joy and great rejoicing, as they rejoice before you as at the harvest, as people make merry when dividing spoils. ". . . . For a child is born to us, a son is given us; upon his shoulder dominion rests. They name him Wonder-Counselor, God-Hero, Father-Forever, Prince of Peace. His dominion is vast and forever peaceful, from David's throne, and over his kingdom, which he confirms and sustains by judgment and justice, both now and forever. The zeal of the LORD of hosts will do this! Our Gospel reading (Luke 2:1-14) is the account of Jesus' humble birth as Joseph and Mary traveled to Bethlehem to register for the census of the house of David. The first to bear witness were the lowly shepherds from the surrounding hillsides. Now there were shepherds in that region living in the fields and keeping the night watch over their flock. The angel of the Lord appeared to them and the glory of the Lord shone around them, and they were struck with great fear. The angel said to them, "Do not be afraid; for behold, I proclaim to you good news of great joy that will be for all the people. For today in the city of David a savior has been born for you who is Christ and Lord. And this will be a sign for you: you will find an infant wrapped in swaddling clothes and lying in a manger." And suddenly there was a multitude of the heavenly host with the angel, praising God and saying: "Glory to God in the highest and on earth peace to those on whom his favor rests." In our Christmas Epistle (Titus 2:11-14), St. Paul leads us to remember that Christ promised to come again and will deliver us from all lawlessness. He teaches us how to live while we await our "blessed hope". Beloved: The grace of God has appeared, saving all and training us to reject godless ways and worldly desires and to live temperately, justly, and devoutly in this age, as we await the blessed hope, the appearance of the glory of our great God and savior Jesus Christ, who gave himself for us to deliver us from all lawlessness and to cleanse for himself a people as his own, eager to do what is good. The birth of the Messiah, the anointed one of God, was not just something that happened long ago. It was an event foretold for centuries and awaited fervently by the people of Israel. From the moment of Jesus' birth to his tragic yet triumphant death, he was the embodiment of humility, patience and love. It is how he calls us to live in this age, "temperately, justly and devoutly". We wish for you this Christmas season all the blessings of the Messiah, brought to life on this Christmas night so long ago. May the miracle of Christmas be born anew in our hearts this day and every day as we live out our calling as baptized Catholic Christians - Priests, Prophets and Kings..